Sea Mark 304 offre unità 1BR, 1BA con una cucina completamente attrezzata e lavatrice / asciugatrice nell'unità. Le dimensioni del letto includono una regina e letti a castello nella camera da letto e un divano letto queen nel soggiorno. Ospite fornisce lenzuola e asciugamani. L'occupazione dell'unità è di 6. Situato in posizione strategica a metà città, con una facile passeggiata per la spiaggia, ristoranti, negozi e attività. Pulito e conveniente, questo è un noleggio perfetto per una coppia, piccola famiglia, o chi cerca una vista uccello quando le auto d'epoca sono in città! Non fumatore. Non sono ammessi animali, per favore. I nostri proprietari non consentono il noleggio di gruppi per gli ospiti di età inferiore a 25 anni. Si prega di notare che non pubblicizziamo alcuna proprietà sulla lista di Craig. Se vedi il contenuto delle nostre inserzioni nell'elenco di Craig non è un annuncio legittimo da Central Reservations. I had a great experience. The booking company was very organized and professional. The condo was clean and comfortable. We enjoyed our stay. 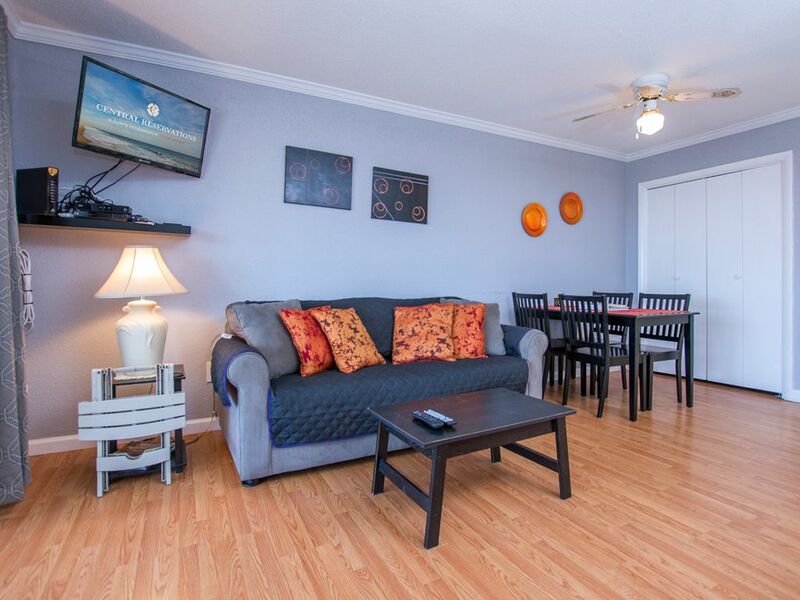 Our family of four enjoyed this cute apartment less than a block off the beach. The bunk beds were a little tight for our tall teenage sons but one slept on the hide-a-bed in the living room and it worked out. The shaded parking under the building was also a nice bonus. There were plenty of dishes, pots and pans for cooking there and a line on the back balcony to hang our towels after a day at the beach. Very clean property, with the options of a kitchen and spacious living room. Clean property and very quiet family friendly location. Would recommend this property and would definitely come back in the future. The moment you walk into the property you notice numerous blinds missing from both sides of the condo. This allows for the tenants to have zero privacy during their stay. Once you look past that you notice that it was not cleaned properly before and that sand covered the floor. We understand you are at the beach but doesn't mean you want sand on your feet all weekend. Also having sand in the bed was not ideal and took some matress shaking to remove it. We did not call because if it was not cleaned properly the first time we chose to do it ourselves to make it comfortable to stay in. Next the Fridge smelled as though the prior people kept crabs in the fridge and also some how the freeze for a extended period and never let it air out. We purposely did not use the Fridge because it even had the ice and ice trays smelling as expired crabs. The last straw was it says to remove and put back all dishes, however the people before us did not remove them and we noticed it when we went to use a "clean" dish from the washer and they had only run it with the water and no detergent. Overall we used this location to sleep and it was not comfortable. I have stayed in numerous places and never once ever left a remark about any, however I am leaving this one to urge people to NOT STAY HERE!. The only GREAT aspect of the stay was dealing with the rental company. They were very easy and nice to deal with. We did NOT complain to them because it was not their fault however if UBER has to inspect the cars the drivers use then I think they should very much so look into this property. We are so very sorry that you had issues in our rental property. The blinds are being replaced with draperies this winter as the vertical blinds were indeed a problem in this unit. We were constantly putting them back up only to have the wind catch them and bring them down again. We have also gotten a new cleaner for this condo as the owner was also not happy with the cleaning. Please let us know anytime that you stay in one of properties if you have any problems at all. We want to experience a great Ocean City vacation and come back to us every year! We loved our stay it was cozy, a tad too small for our family but that's our fault! the kitchen had pretty much everything we needed. Because we went with children it was really nice to be super close to the beach and the grocery store all at once! The bathroom was very nice and sanitized when we walked in. The Back balcony door we had to pry open to use, and the terrible blinds give no privacy nor block the light from outside and Parking was extremely tight ( totally just how it is i know but thought it may be helpful for someone in the future) overall for the price and how close we were to the beach this place was a steal and was perfect for our little mini family vacation! Oh another plus was that dominos, five guys and a nice restaurant was right across the street!